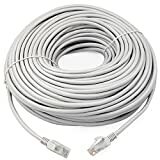 This 50m cable is designed for connecting your PC to hubs, network switches, routers, DSL and ADSL modems. This works with Ethernet networks running at 10Mbps, 100Mbps and 1000Mbps. Please note that this is a straight-through cable and not a Cross-Over cable. This entry was posted in Computer Hosting and tagged Cable, Cat5e, Ethernet, Lead, Network, Patch, RJ45, TRIXES by Host That. Bookmark the permalink.